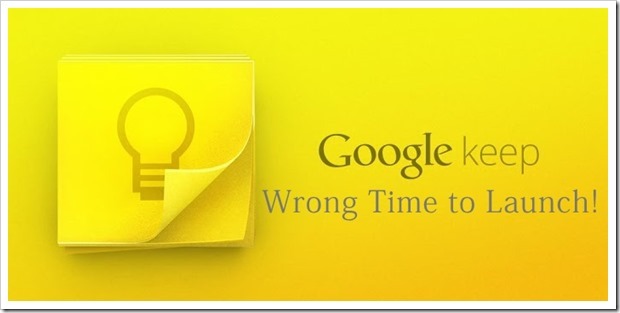 Google Keep gets probably the Worst Launch Timing! Google launched another service in its list of plethora of services it has under its roof. This one is called Google Keep and it is nothing but a simple note taking app for Android. There are many apps in the market that are worthy of our money- Evernote, Catch, Springpad etc. Google Keep however tries to keep it simple. Of course, part of the reason is that it is Google’s first step in the arena. I am quite sure that with future updates it will achieve the same features and complexity as the other apps. The second advantage obviously is the integration with Google Drive. This means that all the notes are saved on the cloud in our beloved Google servers. The app itself is good and I found no glitches or glaring omissions (as a simple note taking app). While it may not have the collaboration features of Evernote, I am sure the future versions of Google Keep will surely get collaborative. The thing that annoys me and seems a bit strange is that Google had the courage to launch the app just after what it did to Google Reader. It is not that Reader had as many users as Android. The users of Google Reader were less in numbers but more powerful in their voice. Most are after all power users, bloggers or tech enthusiasts. This means that they are already skeptical about Google’s products. Read this article by Om Malik, which exactly reflects the shift in thinking of power users. For example, why would I leave a company like Evernote, which is dedicated to the note-taking app than come to Google who might kill the app in its next spring cleaning? Google is already facing a lot of heat for Google Reader and in this scenario; Google launches a product that stores my data. Maybe in a few months or so, this launch would have been perfect, but right now, I think Google should have stayed put and dealt with the Google reader debacle. People have started their shift so Google need not worry about people wanting Reader back but adoption of its future products is left hanging. People would have to keep backups as Google might decide to knock off their beloved app any day. On a lighter note, now Google launches an app that wants even more of your personal data. Already knowing all your mails, it wants to know what you buy in your grocery. Would you start using Google, or will you now be more skeptical about using it? Right Gaurav and Google is right to discontinue it if they want to (no reasons needed even!). And in the long run, Google Keep will run on its merit alone but the current launch timing is what I believe is wrong. Already, there are products that offer complete support then why would I want to use a new product by a company that just closed the product I liked by that company. On any other day, I might have jumped to shift just because its something from Google. As for your first point, would you buy a mobile that is going to defunct 2 months from now. Reader is dead, 2 months later will just be its funeral. In fact, if Google Keep was launched then it would not have been such a big deal. Right now, people are not in the best of spirits regarding Google and that is what I mean to say. Firstly its NOT as if Reader was there yesterday and today boom, gone! Users are given prior notice and options to migrate before 100% shutting of service so that there is no damage done and Google was no exception. Secondly, when you say trust, will a lifetime continued support for Reader, guarantee trust for all upcoming apps or products? Nope. Its all about how good your product is and what value it adds. If its good it survives otherwise its a sane choice to retire it and focus your resources on things that add value. Now adding value is subjective. For you it might for me it might not but lets leave it to the creators (Google) to decide whats best for them. Right? Its Simple and smooth app..